I recently reconsidered Roach’s assertion in light of Sixteen: Drummers Suite, the new album by drummer and composer Dan Weiss. Released on Pi Recordings, it’s a suite of dazzling sweep and kaleidoscopic detail, uncompromising in its adherence to a creative vision. Which is another way of saying that it’s a totally bonkers listening experience. (That’s a note of admiration as well as caution.) Weiss, inspired by Roach and five other jazz-drumming totems, has taken that “one-man percussion orchestra” idea to fanciful extremes. He composed his suite for a 16-piece chamber ensemble, and he marshals its timbres with mad-scientist panache, honoring his heroes in ways they never could have begun to imagine. 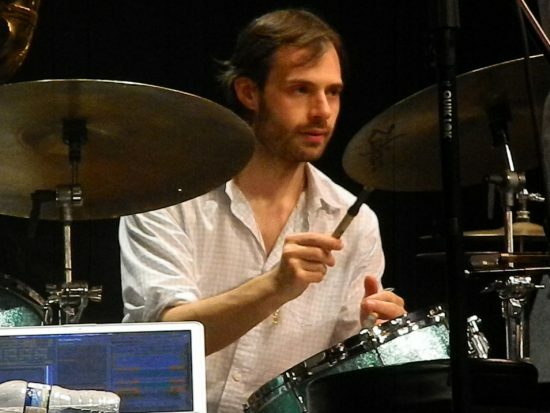 Weiss, 39, has been an important presence on the progressive jazz landscape of this century, a drummer whose deep commitment to pulse cohabits with a sharp attunement to texture. I’m pretty sure I first heard him in a smartly surging band led by alto saxophonist Dave Binney. That quartet’s rhythm section-Weiss, bassist Thomas Morgan and pianist Jacob Sacks-maintained a separate life as an acoustic trio, and I soon took notice of its shared intuition, which unlocked a new set of possibilities from one moment to the next. Weiss has brought the same feline alertness to an array of other contexts: He can be heard on excellent recent albums by alto saxophonist Rudresh Mahanthappa, pianist Matt Mitchell, guitarists Miles Okazaki and Rez Abbasi and trumpeter Amir ElSaffar. Every truly creative musician draws on a wealth of influences, and in Weiss’ case, nothing looms larger than an interest in Hindustani tabla drumming. In the late ’90s he began studying with Samir Chatterjee, whom he still claims as his guru. Mastery of the tabla involves a profoundly rigorous immersion, which Weiss embraced wholeheartedly. The first album under his name, released in 2005, was Tintal Drumset Solo, an ingenious adaptation of tabla conventions to the palette of cymbals, toms, kick and snare. It was the first official sign of an obsessive attention to detail that I consider an essential Dan Weiss trademark. Several years ago he began posting a series of YouTube videos involving drum-set translations of human speech cadences: the rat-a-tat patter of an auctioneer, the comic spiel of an old FedEx commercial, the intricate flow of rappers like Busta Rhymes. (The most recent entry reimagines Lennie Tristano’s famous piano solo on “Line Up” as a concerto for brushes.) The injunction to regard a drum set as a one-man orchestra has rarely been taken so literally. Fourteen, released on Pi in 2014, announced Weiss’ ambitions as a large-format composer, with a slurry of ideas borrowed from extreme metal and modern classical music as well as tabla studies and the jazz avant-garde. Most of the musicians from that album also appear on Sixteen, including Binney and Ohad Talmor on saxophones; Ben Gerstein and Jacob Garchik on trombones; and Judith Berkson, Lana Is and Jen Shyu on wordless vocals. The rhythm section once again comprises familiar collaborators-Morgan, Sacks, Mitchell, Okazaki-alongside a harpist, Katie Andrews, and a tabla player, Stephen Cellucci. What’s strikingly new about Sixteen is the premise. Each movement of the suite is inspired by a famous jazz drummer: Ed Blackwell, Kenny Clarke, Elvin Jones, Philly Joe Jones and Tony Williams, along with Roach. But rather than evoking these heroes in portrait, with all the poetic license that implies, Weiss takes an almost forensic approach, designing complex ensemble maneuvers in response to the briefest scraps of recorded evidence. This idea grew out of a close analysis of Elvin Jones with the John Coltrane Quartet; Weiss fixated on a polyrhythmic pattern from one live version of “Vigil,” from Belgium in 1965. More specifically, the pattern occurs between 2:15 and 2:23 in a clip of the performance on YouTube. As an evocation of Jones, that sample seems wildly reductive, but the swaggering cadence of those eight seconds can be heard clearly in the track titled “Elvin”-just as Roach’s boppish crosstalk between snare and kick drum, during a nine-second interval on his 1958 album Deeds, Not Words, provides a blueprint for the far more cerebral syncopations of “Max.” Weiss is engaging here in a radical extrapolation, not unrelated to the impulse that drove playwright Tom Stoppard to spin Rosencrantz and Guildenstern Are Dead out of a single fraught line in Hamlet. At the Jazz Gallery, where Weiss and his ensemble appeared in early February, the suite took on a tactile intensity, dense and roiling. 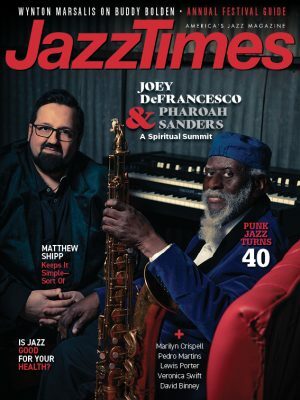 “Tony,” which responds to one of the more expressive moments in Williams’ serpentine playing on “Nefertiti,” with the Miles Davis Quintet, featured a web of dissonance, with deft yet stuttering asides; it also contained one of the better flareups of improvisation, an alto saxophone standoff between Binney and Tim Berne. “Philly Joe” began with an exploratory précis for tabla, synthesizer and drums, setting up a calmly hovering unrest. Generally speaking, the intensity of the focus among the players was mighty impressive, even if I occasionally found myself mentally searching for a clearing, a space where the music could open and breathe. But then-during “Klook,” inspired by the swish of Kenny Clarke’s hi-hat at the outset of Dexter Gordon’s “Broadway”-there came a swinging interlude in oblong meter, and I sensed the band unclenching. Weiss even indulged in a drum solo, a barrage of single-stroke rolls that evoked the aleatory clatter of a box of firecrackers. As with the rest of the suite, it felt deliberate and contingent, an orchestral gesture rooted in whatever’s close at hand.